Mayan civilisation was extended over 3,000 years during which they developed many city states with impressive size and populations. With the passage of time and the expansion of these city states, their interests clashed with each other and this gave rise to Mayan warfare. They city states fought with each other for political control of the people and resources. According to some scholars, capturing of prisoners for human sacrifice was also one of the important reasons of Mayan warfare. They used endogenously developed weapons for warfare. Scholars have also asserted that Mayan warfare went on to become one of the main reasons for the downfall of the Mayan civilisation. The history of Mayan warfare is quite interesting since it begins as the city states come into clash with each other. Thus there is very little evidence of Mayan warfare during the Pre-Classic Period of Mayan civilisation. It was during the Classic Period of the civilisation, from 250AD to 900AD, when the urban centres were fully developed and their interests came into conflict with each other. Thus we find evidence of warfare between major Mayan cities during the Classic Period. Among other cities, Mayan warfare became an important reason for the collapse of perhaps the most important Mayan city of all, Tikal. According to some scholars, capturing of prisoners for human sacrifice was also one of the important reasons of Mayan warfare. Scholars have traced various ideological reasons behind Mayan warfare. It is true that political power and the capture of resources were the main driving forces of mayan warefare. But there were other ideological reasons as well. One of the most important ideological reasons of Mayan warfare was the capture of victims for human sacrifice. This even included members of the royalty of enemy city states, Captured Royals were sacrificed since the members of royalty were thought to have sacred blood and their sacrifice was of more value. Sacrifice of an enemy king was considered the decisive defeat of that city state. Not much is known about the war tactics of the Mayans. There was a distance of about 55 kilometres between different Mayan cities and depending on the terrain and other factors, it could be traversed between 2 to 8 days. From various logistics of the journey such as the amount of the weight carried and necessary food, scholars have estimated that there were on average 500-1000 men on each side on the battlefield. At initial stages of the battle, missiles and arrows were used but as both sides advanced, individuals indulged in hand-to-hand combat. The lord of each geopolitical unit was called batab and he was responsible for organising the troops. Mayans used a wide range of indigenously developed weapons for Mayan warfare. Most common weapons used in individual weapons included crafted forms of obsidian and chert. Mayans had also developed projectile technology such as long-range spears and atlatl, a device to throw darts and spears at high speed. Sharpened obsidian and chert were often attached to atlatl darts, spears, and arrows and used for an attack. In close range combat, clipped flint was also frequently used. Darts and spears, however, were the primary weapons used in Mayan warfare. The organisation of Mayan warriors was not as impressive as the latter Aztecs who had warrior societies. However, it was common for the members of the nobility to hold certain military positions which were then passed on to their succeeding generations, thus creating a class of warriors. 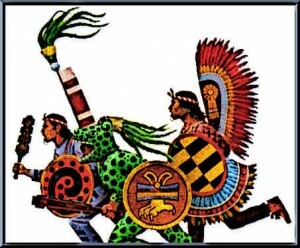 These warriors were trained in different aspects of Mayan warfare including military strategy, ritual, and war dances. Regular training exercises and drills were held for warriors. But this class of permanent warriors was quite small and most of the people who fought wars were ordinary farmers. The outcome of a military campaign could vary from one city state to another. Considered overall, it proved quite disastrous for the Mayans. In some cases, for instances, the cities were sacked and destroyed, never to be settled again. An example of this is the Classic Maya site of Aquateca located in the present day Guatemala. There is extensive evidence of Mayan warfare in the region and, according to the archaeological evidence, the city itself was captured and destroyed around 810AD. This led to mass evacuation of the city and its complete collapse. Often people of the subjugated city were settled in the victorious city with some of them being used for human sacrifice. Archaeological evidence suggests that a lot of famous and thriving Mayan centres were destroyed because of chronic warfare in the region during the Terminal Classic Period. One such famous city was Aquateca which was destroyed around 810AD and was never settled again. Chola was another thriving urban centre which was captured and abandoned during the Terminal Classic period. Another acropolis that succumbed to chronic warfare during the Late Classic period was La Blanca. Chronic warfare between different Mayan city states has often been cited as one of the foremost reasons for the downfall of the Mayan civilisation. The warfare became particularly intense during the late Classic Period of the civilisation and according to the archaeological evidence several cities were sacked and destroyed, never to recover again. Other than Mayan warfare between different city states, foreign invasion such as the Toltec intrusion is also considered to have contributed in the decline of the civilisation. The Mayan Civilisation prospered during its Classic Period but around 900AD, the civilisation almost abruptly collapsed and entered into the phase known as Pre-Classic Period. Mayan warfare has been cited as one of the foremost, though not the only, reasons for the collapse of the Mayan civilisation. Mayans fought wars for political control and the control of resources but capturing prisoners for human sacrifice was also one of the most important reasons. After the enemy city was conquered, it was common to sack it and force the population to leave. This happened in the case of several major Mayan urban centres including Tikal. Mayans used a variety of indigenously developed weapons for Mayan warfare, although the emphasis on warfare was not as strong as it was among the Aztecs who followed the era of the Mayans.